We keep hearing all about it when discussing public education. The reformy types, like Stand for Children, feel that the gap can be erased by "raising the bar", advocating for charters and high-stakes testing, collecting more data, and making sure teachers are "effective". Last week, State Senator Alan Bates, D-Ashland District 3, held an education forum with the topic: "Strategies to Bridge the Achievement Gap." 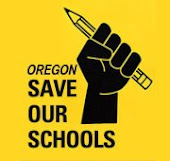 Oregon SOS has provided our own set of solutions in how to help our students who continue to struggle under the decade of the NCLB/NCLB Waiver model. A shift in philosophy and values with regards to rebuilding our public education is long overdue. Our position paper and list of suggestions of what we are for on this topic is listed at the link below.